Log siding will give any home the look of an authentic log structure without the expense and other drawbacks. It is very affordable and also quite durable, though it does require consistent maintenance. If you are considering log siding for a new construction project or home remodel, this log siding price guide will help. This log siding price guide gives an overview of the features you get with log siding including its strengths and weaknesses. Log siding prices are included to allow you to evaluate if it is worth the money for your purposes. There are very few national log siding brands. Most of it is sold by distributors that get it from local harvesters and producers. 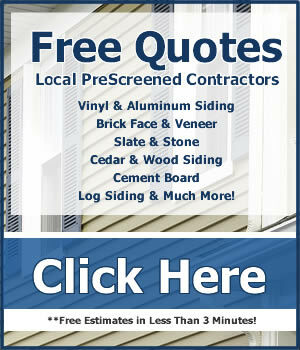 Ask your siding contractor or local building supply dealer for the best materials in your area. You’ve got several interesting options for log siding. The most common styles are quarter log and half log siding. Quarter log siding is generally 2” thick; half log siding is 3” thick. Oddly enough, you might also hear quarter log siding referred to as half log siding and half log siding referred to as full log siding due to their appearance when installed. Keep the thickness in mind in order to avoid confusion. The siding comes in widths of 6”, 8”, 10” and 12” with lengths from 8’ to 16’. These products are sometimes called “D” siding because of the shape of their profile. More flat siding called chink log siding comes in 1”x10” and 1”x12” styles and is usually less expensive. The materials used for log siding are pine and cedar, for the most part. Some fir and spruce is used as well, especially where it is locally grown in large quantities. The finish of the siding can either be smooth or have a more genuine hand-hewn drawn knife appearance. Pine log siding costs for 2” thick material are $2.25-$4.00 per square foot. The 3” material is $3.50-$5.00 per square foot. The cedar siding costs for 2” thick material are $3.50-$6.00 and for 3” material are $5.50-$8.00 per square foot. Chink siding costs $2.00-$3.00 per square foot. Some siding materials are priced by the “square” which is 100 square feet of material. If you’re comparing log siding prices to materials sold by the square (100 square feet), multiply these prices by 100. These are material costs. Log siding installation cost ranges from about $200 to $400 per square. When you love the look of wood logs but want more convenience at a lower price, wood log siding is a fantastic option. Your home’s structure should be in excellent condition prior to the installation of log siding. We’ve covered the cost of the siding. You might incur additional expenses from repairs and additions required prior to the siding being installed. Here’s a short list and their costs. With time, houses settle, and studs can bulge or twist. These events often damage the sheathing too. The plywood or OSB should be removed, repairs made and sound sheathing installed. This ensures that the appearance of your new log siding isn’t marred by underlying structural issues. Cost to repair framing and sheathing: $3.75-$6.65 per square foot. When gutters, caulking and old siding are damaged or fail from age, water can saturate the wood. In time, rot occurs in common locations including fascia, the framing around windows and doors and to the sheathing, addressed above. Wet and rotted wood must be replaced, and this can be a time-consuming, costly project. Cost to replace fascia: $6.00-$9.00 per linear feet for wood; $14.00-$20.00 per linear feet for aluminum or composite. Cost to replace framing for doors and windows: $375-$650 per window or door. Heat and moisture accumulate in attics that aren’t properly vented. Cupped shingles and higher AC bills are caused by heat pushing into living spaces. Mold and rot come with moisture. Older homes often require the installation of one or more gable vents to allow airflow that vents heat and humidity. There are attractive gable vent covers to match log siding. Cost to install gable vent for log siding: $75-$150 each. It’s common to remove old siding to find the home doesn’t have WBR, commonly called house wrap or Tyvek, or what’s there is in poor condition. Many siding contractors recommend adding a fresh layer on all siding jobs. Wrap is now code because it helps control moisture and air leaks. This is an affordable upgrade that pays for itself quickly by lowering utility costs and protecting your home. Cost to install houses wrap WRB: $1.15-$1.40 per square foot. The most common reason for choosing log siding is that it is a natural product with genuine beauty. It gives your home a look that vinyl log siding simply cannot achieve. It has an appearance, a smell and a feel that can’t be mimicked. Log siding is selected over whole log construction because it costs less – unless you have a ready source of timber available to you at little or no cost. In addition, a genuine log home presents challenges for wiring and for heating and cooling systems, especially in homes with more than one story. You don’t have any of those concerns with log siding. It works well with new and existing stick-built or post and frame homes. Your options for appearance include chinked siding or non-chinked siding. The reason many homeowners choose chinked siding is that it gives the home a more authentic log look. The downside is that the installation of the chinking is an extra cost and it will require maintenance in the future. The biggest concern with log siding when compared with vinyl siding, aluminum siding, stone, brick is the level of maintenance required. If you choose pine, you’ll need to use a stain with sealant in it every 2-5 years. Cedar log siding requires less maintenance than pine, but more than vinyl siding. Log siding can be susceptible to insect infestation if not properly maintained and it will burn more readily than most siding types. You might want to take a look at the Exterior Siding Material Guides page for a handy comparison of today’s most popular siding types. While you’ll get the lowest log siding cleaning estimates from unlicensed handymen, there is risk involved too. If anything goes wrong, for example, if excessive spray pressure is used and your siding is damaged or water leaks into your home, it might be difficult to recover the cost of repairing the damage to your home. The best way to get low log siding cleaning cost estimates and protect yourself is to request competitive estimates from several licensed and insured companies. Careful pressure washing is the recommended cleaning method. First, a dirt-loosening, low-foaming cleaner is sprayed onto the siding and allowed to work for a few minutes. Then, with the pressure washer set no higher than 1,500psi to avoid gouging the wood, the cleaner can be sprayed away. Heavy soil might have to be carefully loosened with a soft-bristled brush prior to the rinse. Before the siding is cleaned, inspect the chinking and caulk, and make repairs at least a week before the siding is cleaned.